Can we turn more scientific discoveries into practical health benefits for everyone? A framework for mental health research was released by the Department of Health on 7th December 2017. It sets out a vision for how, over the next 10 years, we can progress understanding of prevention, care and treatment through investment in mental health research. We have been on the steering group for this project, and thus know first-hand how complicated this piece of work has been from beginning to end. We send a huge thank you to Department of Health staff for getting the framework launched. It should help us all in our work make a difference. Because that is the point isn’t it. We want research activities to improve understanding and lead to practical changes benefitting people’s lives. From our point of view, an important consideration was ensuring methodological work was progressed in mental health, and particularly what we call peer research. We want more research teams to integrate the expertise of people who have direct experience of mental health issues in studies using structures that can facilitate meaningful contributions. We see expertise from experience as an essential ingredient in a successful research team alongside clinicians and academics including the statistician, trial manager, qualitative research expert. The framework’s nine recommendations are summarised below. Terms such as co-production, user-led research, patient and public involvement all have their own history with values and principles at their core. These are incorporated into the framework for people to digest and progress. We have highlighted one recommendation which includes the importance of building a diverse research community. This is vital for PPI but also all other aspects of mental health research. It speaks to the importance of co-ordination and leadership within and beyond the traditional mental health sector. 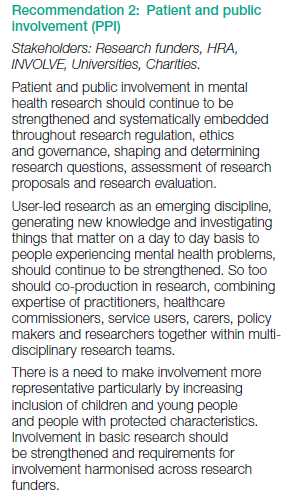 Something the research councils are already tackling in a current call for proposals for the establishment of cross research disciplinary networks to strengthen the UK mental health base and build research capacity. Linked to diversification in research – leadership, topics studied, people working on them – we are keen to see more inclusive approaches in mental health studies and a commitment to capacity building. We have ideas of our own at McPin and plan to launch a new programme next year supporting the development of the mental health research sector. “Promotion of good mental health and the prevention or treatment of mental ill health across the whole life course. We welcome proposals for clinical and applied health research that evaluate healthcare interventions, health services, social care or public health measures operating at either the individual, or the population level. Issues of particular interest include proposals that utilise new digital health technologies or investigate their effects”. There are some significant challenges ahead for mental health research. The framework is a call to action for the whole community to step up and accelerate scientific progress. At McPin we want to focus on those pieces of research that matter most to people with mental health problems and their families. Do tell us what your priorities are for us in 2018. We’d love to hear from you.